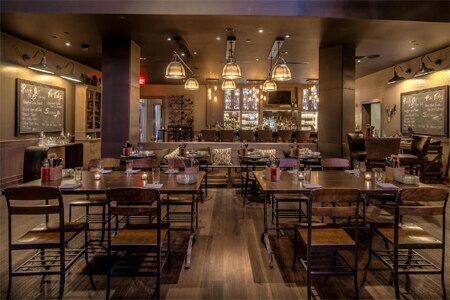 Gastropub Cook Hall provides all meal services to the W Atlanta - Buckhead. : One might expect the menu in this Buckhead gastropub to purvey the sort of dull bar snack fare that often is found in such places, but this is a much more serious yet fun affair. First select a cocktail: Cook Hall offers lots of options, but you also may use the personal cocktail kit to craft your own. It comes complete with everything needed, from the maraschino cherries to the house-made bitters. Otherwise, choose a glass of Verdejo from Rueda, Spain, or a rosé from Cahors, a unique beer or a pour of any of a number of small-batch liquors. Food brings on inventive nibbles, such as deftly fried "popcorn" shrimp with a house-made ranch dressing; ground popcorn constitutes the breading. Tiny beets of all stripes, literally, come to the table in a variety of colors and sizes. The highlight of the menu is pork belly, a lean strip of Kurobuta topped with fennel and accompanied by a Greek yogurt-horseradish sauce. For dessert, watch out for the deconstructed s'mores, if available. Chef David Gross has graced many an Atlanta restaurant’s kitchen, including the previous Market located in the hotel, but here steps out onto his own stage to good effect.